Welcome to the Department of Orthopaedics & Sports Medicine website. Our website provides a comprehensive multi-media overview of our Department’s members, activities, expertise, and interests. Visitors to our site can peruse in-depth information as well as patient education articles. You may also read about our nationally and internationally acclaimed faculty, including where they trained, their areas of surgical specialization, research interests, and patient care philosophies. In the Education section of our website, visitors can learn about our acclaimed training programs. Our cutting-edge research laboratories and scientists are highlighted in the Research section of our site. Our Orthopaedics & Sports Medicine faculty see patients throughout the region. Some of our sites of practice include; The University of Washington Medical Center (UWMC), Harborview Medical Center (HMC), Northwest Hospital (NWH), Sports Medicine Clinic at Husky Stadium (SMC), Veteran’s Affairs Puget Sound Heath Care System (VA), Seattle Children’s Hospital (SCH), Seattle Cancer Care Alliance (SCCA), Bone & Joint Clinic on Roosevelt, Eastside Clinic, The Sports Medicine Clinic at Northwest Hospital and Medical Center, and our recently opened Orthopaedic clinic, at the Northwest Primary and Specialty Care Center on Meridian Ave.
Our department has multiple subspecialties. The sports medicine service treats athletes of all ages and expertise along with providing care to the UW Athletics program. The hip & knee service cares treats patients with arthritis using modern joint preservation and joint replacement surgeries. The hand & upper extremity service provides expert care from carpal tunnel surgery, complex elbow surgery, to finger and hand replantation. Our shoulder and elbow, foot and ankle, orthopaedic trauma, spine & orthopaedic oncology services are staffed by some of the top surgeon-scientists in the nation. Harborview Medical Center is the only level 1 trauma hospital in the WWAMI (Washington, Wyoming, Alaska, Montana and Idaho) region providing extraordinary care to victims of trauma in one-quarter of the US land mass. As a clinician-scientist, I recognize the importance of fostering an environment in which innovation can thrive. The ideas and research of today may become the medical and surgical practices of tomorrow. We have two state-of-the-art biomechanics laboratories equipped with motion capture and robotic instrumentation. We are one of the world leaders on research on collagen; the key constituent of cartilage, bone and soft tissue. We have a renowned musculoskeletal zebra fish laboratory at our South Lake Union campus. Our Orthopaedic Science Laboratory based at Harborview Medical Center examinees the microscopic and macroscopic response of bone to physical stimulation. The education of societies' future orthopaedic surgeons is the core of our academic mission. We take great pride in the fact that our residency and fellowship programs are consistently ranked among the best in the nation. The Department of Orthopaedics & Sports Medicine is heavily invested in surgical simulation technology and 3D printing. These technologies are being developed as non-invasive aids to prepare trainees for operating on actual patients. In addition, we have frequent “saw-bones” training sessions throughout the academic year. We have created (eMTRCS) that is now used by other programs around the nation to ensure that all residents receive real-time feedback to guide their development as surgeons and physicians. To foster interest in the future of orthopaedic surgery we have created the Orthopaedic Surgery and Sports Medicine Interest Group (OSSMIG). The OSSMIG consists of interested medical students at the University of Washington, faculty advisors and current residents from the Department of Orthopaedics & Sports Medicine. Professor and Chair - Howard A. Chansky, M.D. Vice Chair for University of Washington Medical Center - Albert O. Gee, M.D. Vice Chair for Harborview Medical Center - Carlo Bellabarba, M.D. Vice Chair for Research - Ted S. Gross, Ph.D.
Vice Chair of Division of Pediatric Orthopaedics, SCH - Susan M. Yandow, M.D. Chief of Orthopaedics, VA Hospital - Nicholas Iannuzzi, M.D. Residency Program Director - Douglas P. Hanel, M.D. Associate Residency Program Director - Christopher Y. Kweon, M.D. Associate Residency Program Director - Lisa A. Taitsman, M.D. In addition to providing instruction for medical students, the department provides education at the graduate, residency, and post-residency levels. A fully approved residency program offers opportunities to carry out fundamental and clinical research. Residents may work toward the Master of Science degree by meeting the requirements of the Graduate School and the academic unit offering the degree program. Please contact your doctor for specific questions concerning your condition. If you would like to contact the University of Washington Orthopaedics & Sports Medicine faculty, they see patients at several clinics in the Seattle area. For more information, or to make an appointment, please see Contact Us. To make a clinic appointment, please call: (206)520-5000 or Toll Free (877)520-5000. 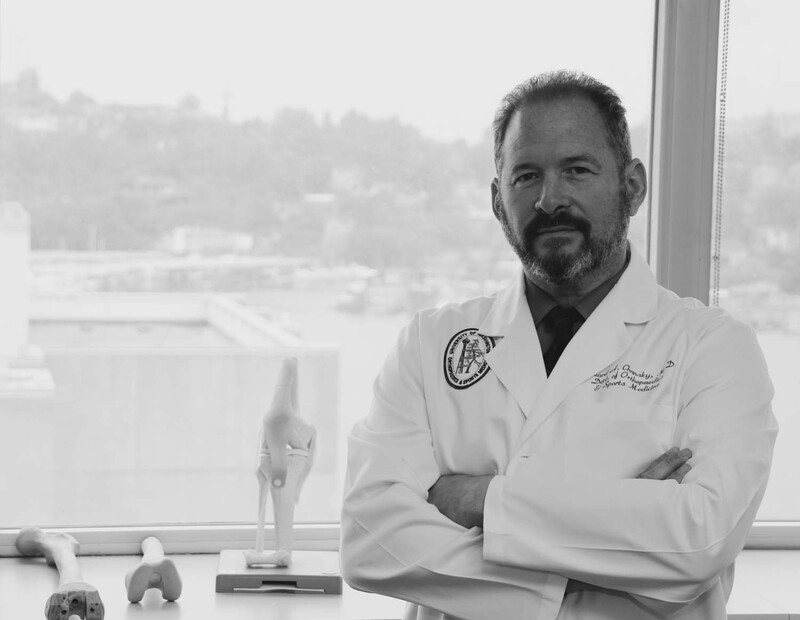 The University of Washington Department of Orthopaedics and Sports Medicine is actively involved in quality patient care, teaching, and research concerning bone and joint problems. Special areas of expertise include foot and ankle, hand and microvascular, hip and knee, arthritis, sports medicine, oncology, pediatric orthopaedics, shoulder and elbow, spine, and trauma.